Are you looking for 2019 to be your breakthrough year for your collaborative practice? 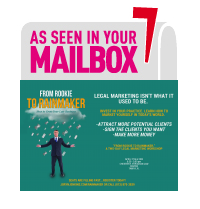 Tired of struggling with caseload and marketing responsibilities? Looking for someone to help you with a step-by-step program, which includes personal coaching? If you’re ready to grow your client base and become an influencer in your collaborative practice, my Changing the Way the World Gets Divorced, Marketing Your Collaborative Practice video series and Mastermind Sessions are for you! To really make a difference in the world and your practice, you must reach as many people as possible. The most influential people in any industry corner the lion’s share of the business. We all know this, yet we err when we don’t focus on marketing, because we don’t develop and increase our “influence.” We then fail to improve our practice. In every industry there are a few Champions (John Maxwell called them “People of Influence”) who are highly credible, who are very visible, and who are making a difference. Are you one of them? Influencers attract the clients we all want--clients who know what they want and are willing to pay for it. Influencers receive more referrals from other professionals and from former clients. They enjoy a greater sense of clarity and purpose in their visions of themselves and of their staff. Influencers are invited to speak about what they do and they write about it as well. Learn how to become that kind of Influencer. I have dedicated five years to learning how to most effectively market a collaborative practice, and now, I am offering that knowledge to you. This is a total of eight and a half hours of video content--available to you on your schedule, when you need it, and when you have time. The content is also available to you and your staff for review for as long as you need. The parts are meant to be viewed in order as each subsequent part builds on the ones before it. A free copy of my book Changing the Way the World Gets Divorced, a $149 value. Three free months of my Mastermind Sessions which are two-hour live online small-group coaching sessions to ensure you get the most out of the book and videos, a $1,500 value. All of this for the one-time price of $795 for lifetime access to the collaborative marketing video series, a copy of my book, and three two-hour live sessions with me to help get 2019 kicked off right. Don't miss this opportunity to become a powerhouse in your collaborative community!